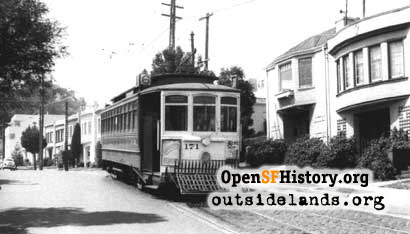 From 1906 to 1948, streetcars ran from the Ferry Building to Sunset Heights. Service Begun: June 10, 1906 (as the United Railroads "Hayes and Masonic" line, terminating at 3rd Avenue and Parnassus Avenue). Route: (As of February 7, 1916) From Ferry Building to 9th Avenue and Pacheco Street via Market, Haight, Masonic, Frederick, Clayton, Carl, Stanyan, Judah and 9th Avenue. Rail service end: July 3, 1948 (replaced by motor coach and a year later by trolley coach). 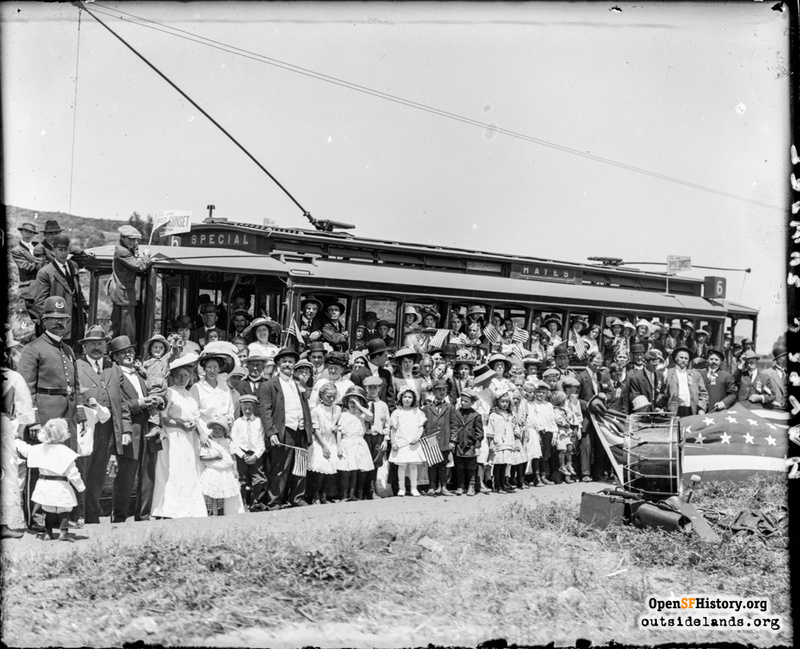 On Sunday, June 16, 1912, the 9th Avenue extension up the hill was commemorated with two ceremonial streetcars covered with bunting, filled with local dignitaries, and heralded by a band that rode along and played the whole way from the Ferry Building to Sunset Heights. There, in a mostly-undeveloped area, the Upper Sunset Improvement Club hosted a celebration with speeches, a grandstand, a giant American flag, tents, free food, and dancing until sunset. A reported 4,000 people attended. The "6 Haight and Masonic" name officially was adopted on February 7, 1916, reflecting the 6-line being rerouted from Hayes to Haight street. From 1921 to 1944 it was operated by the Market Street Railway. The Municipal Railway took over operation of the 6-line in September 1944. The Hayes and Masonic service was replaced by the 32 Hayes and Oak Street streetcar. During peak periods, the 32 ran over the 6-line from Haight and Masonic to 9th Avenue. This line was an early victim of the Great Depression. Following the completion of the Municipal Railway's Sunset tunnel in 1928, 6-line streetcars shared the tracks along Carl Street with the N-Judah. Read about the Harold Lloyd movie shown on a 6-line streetcar in 1929. Sources: "New Car Line Given Big Welcome, Upper Sunset District People Jubilant," San Francisco Chronicle, June 17, 1912, p. 7; Jack Tillmany; John Coll; Walter Rice; Charles A. Smallwood, The White Front Cars of San Francisco, Interurbans Press, 1971. Page launched 8 August 2002.